Above a selection of birds frequently seen here around Trallwyn Cottages...We are very fortunate to have the beautiful red kites flying and dancing in the sky overhead...and to hear the skylark singing high in the sky on a Summers day...the most common birds of prey here are the buzzard, red kite and kestrel. As well as the familiar garden and farmland birds which you would expect, Red Kites, Buzzards, Kestrels and Ravens can be seen throughout the year. 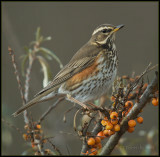 In Winter you can expect to see Fieldfares and Redwings in large numbers and possibly occasional visitors such as the Snipe. In Spring you will hear many of the Warblers singing such as the Willow Warbler and Chiffchaff. In Summer Stonechats and Wheatears can be seen on the moor and many skylarks can be heard singing. Puffins spend most of their life at sea, and only return to land in order to breed. 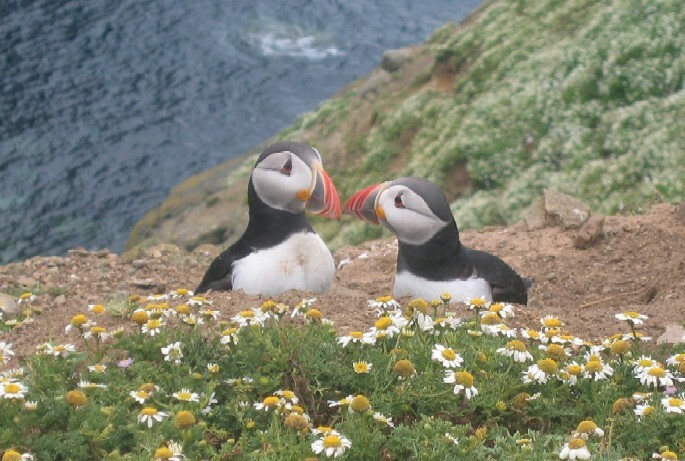 There are around 6,000 breeding pairs on Skomer, which return every March or April. Before coming in to land, the puffins start collecting in large groups on the sea. These increase in size until there are enough individuals present to form a ‘wheel’. The wheel is an interesting aspect of puffin social behaviour, and is most obvious at the start of the breeding season, when large numbers of puffins leave their groups on the sea and fly in large, regular circles over the land. These wheels usually follow the same route every year, and very often they follow some natural geographical feature such as ridges or valleys, which separate a breeding area into a number of sub-colonies. Wheels are a way for these seagoing birds to re-familiarise themselves with the land again, and to pluck up the courage to land. They are also an important way to confuse predators. Though the wheel is at its most obvious at the start of the breeding season, it continues throughout. Puffins on land that are scared by a gull or some other predator often escape and fly one or two circuits of their local wheel before returning to land. Parents returning from fishing trips also often fly around a couple of times before bringing food to the chicks.The courting process often begins on the water, or possibly even before that, on the way back to the island, in established couples. Puffins show their bond with each other by hitting their beaks against each other, or billing. This is also part of the mating ritual, and a greeting. The courting process often begins on the water, or possibly even before that, on the way back to the island, in established couples.Puffins show their bond with each other by hitting their beaks against each other, or billing. This is also part of the mating ritual, and a greeting. Puffins nest in holes in the ground. These may be old rabbit burrows, but very often they dig their own burrows. Established couples use the same burrow for many years. It is usually a little over a metre in depth, with a narrow corridor leading to a nesting chamber. Puffins are sociable birds, and they can be seen collecting in huge groups on the water or outside their burrows towards the end of the day. They can be seen at dusk visiting their neighbours’ burrows, and they have specific sites for socialising, known as the ‘club’. This is usually an obvious mound or rock, and individuals assemble here to meet a mate, to relax and sleep, to land and take off, and to assemble when danger looms. The female lays one egg in May, and the parents take turns to sit on it. It takes about six weeks to incubate the egg, and during this time each parent usually spends more than a day caring for the egg, though they will occasionally leave the nest to preen, to visit their neighbours, or sometimes even to fly off for a short while. These short periods of cooling do not seem to affect the development of the chick. In the last days before it hatches, the chick gradually makes a hole in the shell using an ‘egg tooth’ at the end of its beak. The puffin chick resembles a fuzzy ball of down, and after it has hatched, the parents continue to contribute to its body warmth by snuggling up close to it in the burrow. After about three days, the chick can keep itself warm, allowing both parents to go fishing. For the next six weeks the chick grows quickly as the parents feed it. They can often be seen returning to the nest with beakfuls of sand eels. The beak is especially adapted to be able to carry a number of fish at the same time (more than 30 on some occasions!). The inner edge of the beak has a series of backward facing spikes to keep the fish in place. When they come back to the nest they have to hurry in case they are “mugged” by a gull or a crow, but otherwise they appear to be fairly leisurely creatures. As it grows, the young puffin also loses its down and grows smooth adult plumage. In the few days before it leaves home it loses a little weight, though it keeps some of the fat reserve it has stored to support it on its first journey. It also exercises its wings inside and outside the burrow. Though the parents don’t play any part in the final departure of the chick from the breeding ground, they can be of help to it in the period leading up to its independence, by making sure it is safe for it to leave the burrow, and warning it to return if there is danger near. When the chick is about six weeks old, it leaves home. It does so alone in the middle of the night. The departure of the young puffins happens gradually over a period of a number of weeks in August, with a few hundred chicks leaving in a single night at the height of this period. Good timing and a sense of direction are crucial at this moment, because leaving the burrow when a predator is nearby, or a clumsy flight ending in a fall, could be fatal to the young, inexperienced bird. When it leaves the safety of its burrow on the night of its first flight, the chick can look around and take notice of its surroundings before it leaves. The sound of gulls or strong wind cause it to disappear back down its burrow, but if it is safe it stays on the surface and flies. If all goes well, it stays airborne for a minute or two, over the burrowed slopes of the colony, and out over the water before landing a few hundred metres out from the land, beyond the main danger area where gulls are still looking for an easy meal. Then it swims as fast as its little webbed feet will allow, away from the land. By dawn, it will be a number of miles out at sea, perhaps in an area where other chicks and adults have already congregated. The parents do not wait around long after the chick has left the nest, and the mass exodus of puffins can happen very quickly, with hardly any puffins left by the middle of August. Because most puffins keep their distance from land outside of the breeding season, very little is known about their movements and their behaviour during the rest of the year. Observations from ships in winter suggest that they are distributed in small groups over large areas of the sea. Ringed puffins picked up dead on beaches or in nets have shown us something about the movements of some of these birds. It seems that Skomer’s puffins travel widely, with some being found across the Atlantic ocean as far as the Bay of Biscay. Puffins moult late in winter, just before returning to their breeding grounds. They cannot fly during this period, but can still dive and swim for their prey. This is the time when the transformation from dull, colourless bird to the dramatic colours of summer occurs. The young birds keep their dull feathers and stay out at sea whilst the older ones return to their colonies. It is rare to see one- or two-year old birds at the breeding colony. After three years of age, the young birds develop the bright breeding colours, and come back to land regularly every spring. Individuals younger than about five usually return later than the adults, and don’t breed, but rather just stay around the area and learn from more experienced individuals. 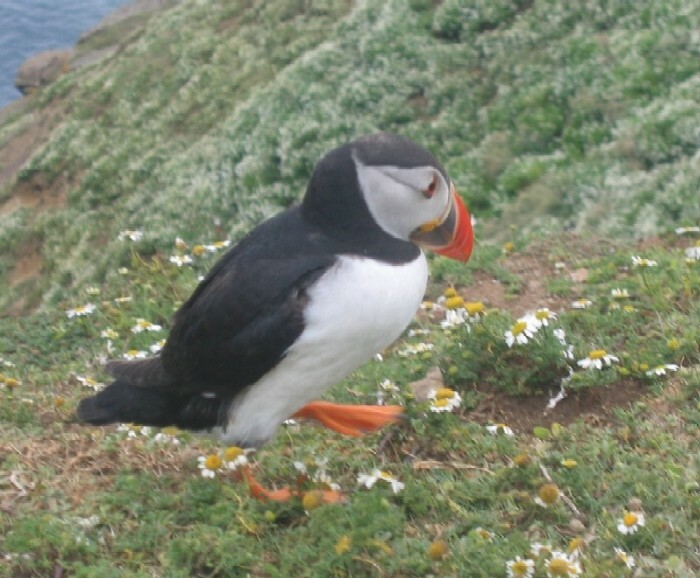 After five years of age, the young puffins breed themselves for the first time. One fifth of the world’s population (around 120,000 pairs) of these amazing birds nest on Skomer, but even so, the day visitor is unlikely to see them. 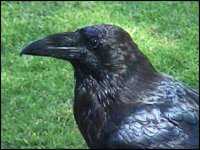 This is because they nest in burrows under the ground, and because they don’t return to the island until after dark. This habit has evolved in response to their predation by greater black-backed gulls. The Manx shearwater is easy prey for a gull, as they are not very steady on their feet. Their legs are very far back on their bodies, making them perfectly streamlined for flying and diving, but rather clumsy on land. For this reason they prefer to land on dark, cloudy, moonless or stormy nights, when it is harder for the gulls to see them. Even so, a number are still caught every year by the gulls. This bird has a very interesting life history. They return to the same nesting burrow every year in March, to prepare the nest and find a partner, usually the same one as the previous year. After mating, the female goes out to sea for about a fortnight to feed and form an egg, which is around 15% of her body weight. The male stays close to the burrow, visiting it regularly, perhaps to make sure it is not taken over by another bird. After the egg is laid, the male and the female take turns to incubate it, whilst the other goes to feed at sea. The egg hatches after around 51 days. After hatching, the chick remains underground for a further 70 days. During this time, the parents fish, coming back every few days to feed the chick on partially digested fish. Towards the end, when the chick is bigger, the parents come back more frequently, so that it is being fed every night for a period. When the chick is at its largest it weighs about a third more than an adult shearwater. Towards the end of its time underground, the chick is left alone altogether, as the parents migrate to the seas around south America to spend the winter. After a few days on its own, the chick starts to come out of the nest to exercise its wings, and around the eighth night, it sets off itself on the long journey for the waters near Argentina and Brazil. The extra fat it has stored before the parents’ departure sustains it on the journey whilst it learns to fish for itself. 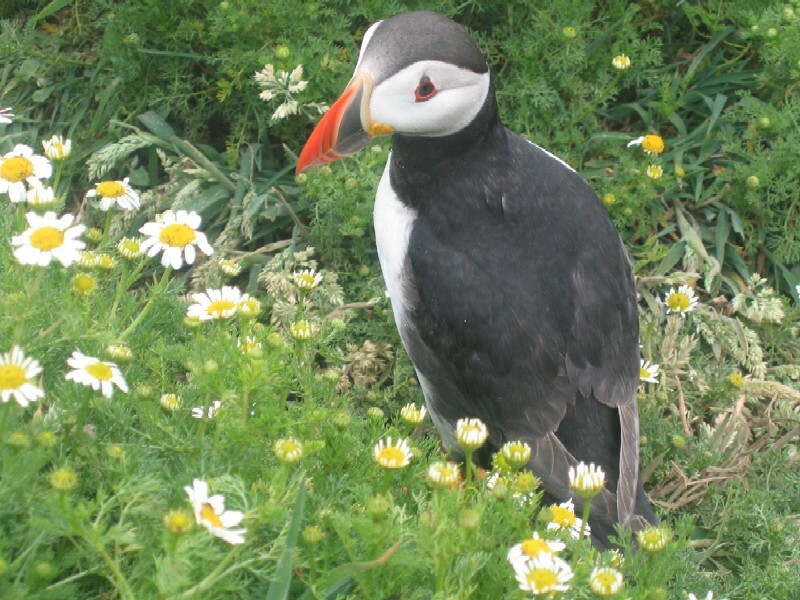 Studies on the Skomer birds have shown that they complete the 6,000 mile journey in less than a fortnight. Some are attracted to the lights of the towns and villages of Pembrokeshire, or are blown off course and end up on land. It is very important to return these birds to the sea as quickly as possible so that they can begin their journey in good condition.